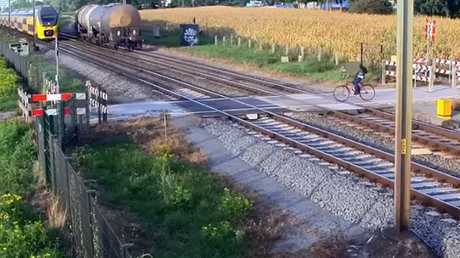 Surveillance footage has captured the scary moment a cyclist rode through an unguarded crossing, not realising a train was speeding towards him. 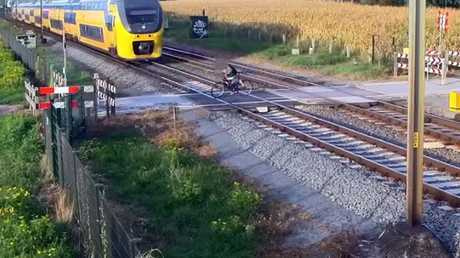 The cyclist can be seen at a rail crossing in Geleen, Netherlands - a city in the southern part of the province of Limburg - waiting for a freight train to pass. After it crosses, the cyclist can then be seen pedalling forward over the unguarded crossing. It appears his view was obstructed by the train that had just past, not realising another was approaching from the same direction. 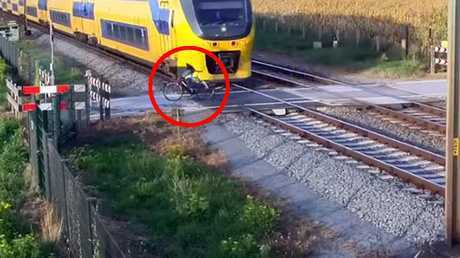 As soon as he spots the train, he quickly removes his left foot from the pedal and frantically pushes himself out of the way with the nose of the train narrowly missing his back tire. The cyclists can then be seen pulling over after the terrifying experience. 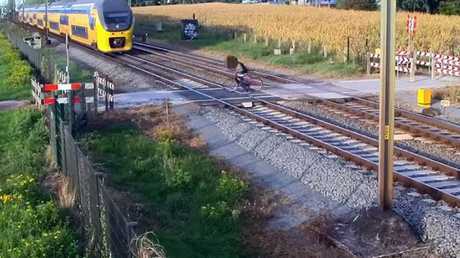 The surveillance video was posted on Twitter by ProRail, which oversees the Dutch rail system. ProRail wants unguarded rail crossings eliminated, CNN reported, and is involved in legal action to have them closed. In 2018 alone, three people died at unguarded crossing, the publication reported.